When it comes to promoting and marketing your app, there’s no better way than using a dedicated app landing page. A landing page will allow you to announce the launch of your app and help you drive app downloads and sales numbers. While you can create an app landing page from scratch, you’ll save hours of precious time by using a premade mobile app landing page template. Luckily, there is no shortage of beautiful app landing pages templates—all you’ve got to do is find the right one. In this post, we’ll showcase the best app landing page designs from our marketplaces. If you’re a designer looking for high-quality premium app landing page templates, don’t miss Envato Elements. This popular marketplace offers dozens of app landing page templates but it also includes other attractive design assets such as brochures, business cards, fonts, and more. You can find plenty of beautiful landing page templates for apps on Envato Elements. The biggest advantage of using Envato Elements is the fact that it uses a subscription-based model, which means that for a low monthly fee, you can get your hands on thousands of design assets for unlimited use. Take a look at some of the best-selling app landing page templates that Envato Elements has to offer. They feature attractive, responsive designs and are easy to set up and customize. They’ve also been optimized to load fast and help you get a better ranking in the search engines. The first template on our list is a multipurpose template that can be used to promote any type of app. The template includes six different versions and you can easily display app reviews, including several calls-to-action, and feature your development team that created the app. The template also features a working contact form and it’s easy to customize. Riven is a beautiful app landing page template with a clean design and comes with more than six layouts. The template includes tons of sections designated for various purposes such as the main slider in the header, features, counter, app screenshots, and more. The template is also fully responsive, includes multiple header and footer options, and can be customized to match your brand. You’ll also find the option to include social media feeds from Twitter, Instagram, and other platforms. Consider the Label landing page template if you want to promote a software. This template features a modern design with a material color scheme and eight different demo versions that can be customized to fit your needs. The template is responsive and comes with all the needed sections to showcase what your software offers, build trust with testimonials, and invite visitors to sign up with multiple calls-to-action. What’s more, the template integrates with MailChimp so you can easily build your email list. The last example from Envato Elements, Flare, is a bold and modern landing page template with the ability to collect leads as well as allow people to click through and make a purchase. The template includes 12 different pages and you can customize colors, fonts, and other visual styles. It’s fully responsive, includes pricing tables, a statistics counter, and a beautiful parallax background that works well with call-to-action buttons. As mentioned earlier, if you’re a designer, Envato Elements is a no-brainer choice. When you sign up for Envato Elements, you get access to as many design assets, templates, and other elements as you need and you don’t have to pay for each item separately. This can help keep your overhead low which is especially important if you’re a freelancer. However, if you’re a business or agency owner that often needs design assets on a regular basis, then Envato Elements is worth considering. Take advantage of the low monthly fee and sign up for Envato Elements so you can download as many landing page templates and graphics as you need, use them in unlimited projects, and customize them to fit your needs. If you need to buy an app landing page template for one-time use, then be sure to check out ThemeForest. 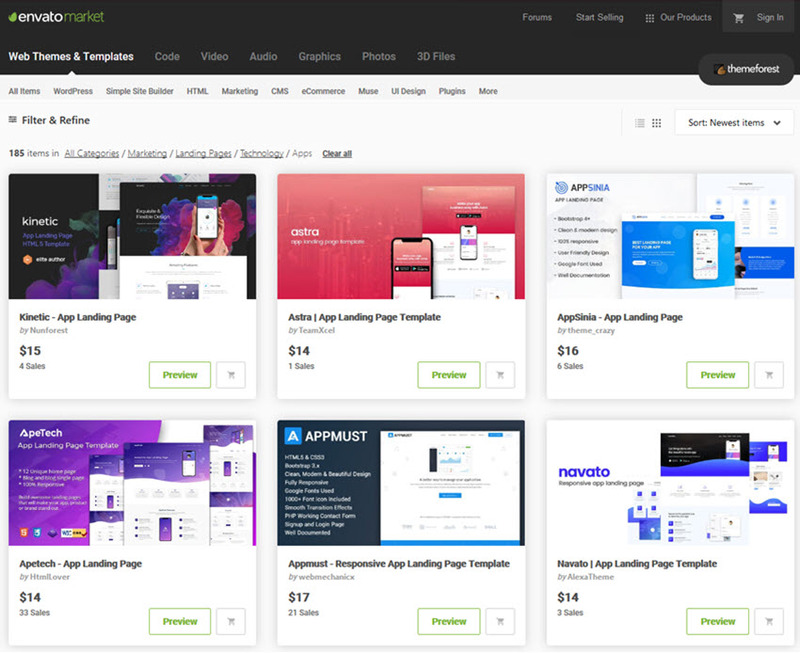 This popular marketplace has dozens of app landing page templates, but you only need to pay once for the item you want. ThemeForest is a good source of app landing page templates. There’s no ongoing fee so if you’re in a hurry or DIY-ing the landing page for your app, then ThemeForest is a sensible choice. 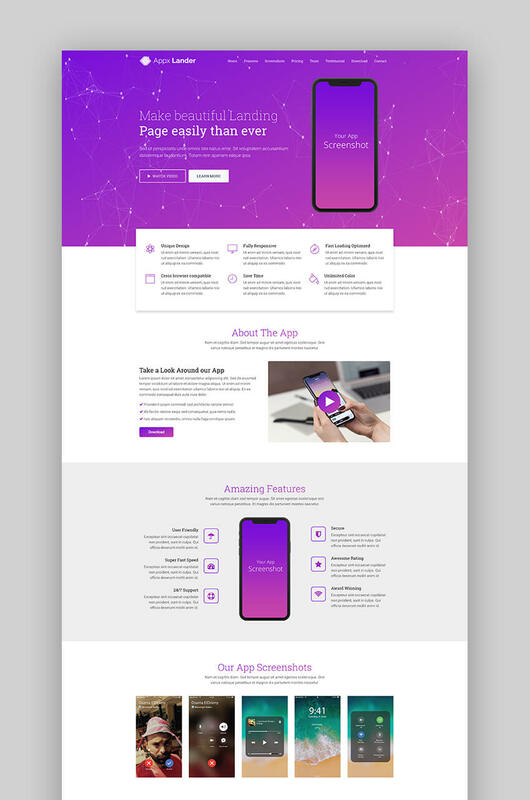 The ApeTech template is a colorful app landing page template with a number of different demo versions. Each of the demo versions comes with a responsive design and plenty of sections to feature the benefits of your app, showcase app screenshots, place several calls-to-action, and build trust with reviews. The template is also fully responsive and easy to customize and install. The Appmust template is fully responsive and features a rather minimal design where the main focus of the template is your app. You’ll find sections designed to show app or software screenshots, place logos from publications that featured your app, showcase user reviews, and more. On top of that, the template includes three different icon fonts and integrates with Google Fonts so there’s plenty of room for customization possibilities. Consider the Navato template if you want a template with a purpose-oriented design. This template has been designed with conversions in mind so you’ll have no problems adding different sections such as app benefits and features, user reviews, an attention-grabbing headline, and a powerful call-to-action. Additionally, the template is fully responsive and integrates with MailChimp. What makes Olio stand out is the attractive, curvy design. The well-organized structure of the template leads visitors in a logical manner to the final call-to-action where they can convert. The template is perfect for any type of app and is fully responsive. You’ll find all the usual sections for landing pages, including reviews, benefits, app screenshots and more. On top of that, the template comes with all the Google Fonts and more than 900 font icons to add extra visual appeal to your landing page. Consider the Appx Lander template if you want your landing page to grab attention from the start. This template features an animated particle background that draws attention to your call-to-action buttons. You can include app screenshots as well as a video overview of the app, display reviews, and display various pricing plans for your app. What’s more the template comes with several variations which include a slider and video backgrounds, as well as a full-width text template. Very happy with this theme, documentation excellent! Fast and efficient support. The timing for the support was over my expectations. Consider the Mizapp template if you want a landing page template with a creative design. Thanks to the responsiveness, visitors can clearly see all the benefits and features of your app no matter what device they’re using. Build trust with user reviews and feature your development team. Don’t forget that you can also include a video walkthrough of your app thanks to video support. The template is fully customizable and comes with pricing tables, icon fonts, and Google Fonts integration. The Appox template is a feature-rich template that features a responsive and customizable design. This template comes with more than eight different landing page designs, multiple header styles, bonus blog pages, and extensive documentation that’ll help you get your landing page up and running as quickly as possible. The Applandy template is based on Bootstrap which means your template won’t only be responsive, but it’ll feature a grid-based design that makes your entire page look more appealing. The template includes plenty of sections to showcase screenshots of your app and share reviews from other happy users as well as present the app’s features and benefits. The Flyapp template is a multi-concept mobile app landing page template. This means you can use the template to promote any type of app and easily showcase what makes your app special. The template is responsive and you can customize colors, fonts, and other visual styles. A total of four demo versions are included and a few unique sections for listing a video of the app, adding pricing tables, and listing blog posts that talk about your app’s features and design. Try the Appiyan template if you want to draw attention to your call-to-action with unique and stunning animations. With more than nine demo versions you can create landing pages for your app as well as a SaaS product or a software. The template can easily be edited so you can tweak colors, fonts, and more. It’s also responsive and optimized to load fast. Try the Orenda template if you’re looking for an elegant landing page design. This template was designed to be responsive and cross-browser compatible so you can rest assured your visitors will have no issues when visiting your site. The template includes several sections for app’s features, screenshot showcase, user reviews, and you can easily add or remove sections depending on your needs. The Five template stands out with its stunning design and the ability to provide detail about your app without overwhelming the visitors. The template is nicely organized and well-documented as well as fully responsive. It also comes with an integrated Mailchimp form and working contact forms. Finding the perfect landing page template isn’t hard when there are marketplaces such as Envato Elements and ThemeForest. 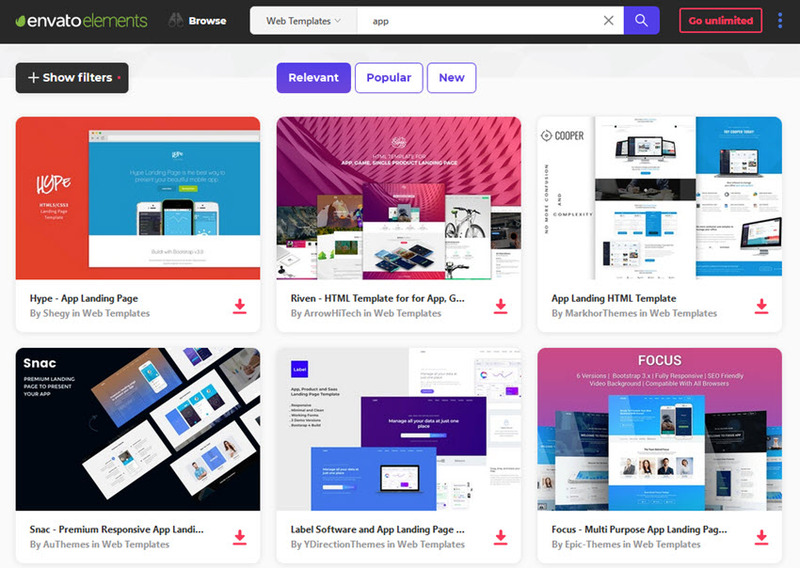 Start by browsing the templates featured in this roundup and if you want to see even more templates, be sure to check out our marketplace.